On the reliability of SST & Marine Air data during WWII (1939-1945)? The Figure illustrates the Northern Hemisphere NMAT data from January 1881 to May 2007. Prior to approximately 1905, there are significant breaks in the data, but since then, the data set is complete for the most part. There are a few months missing here and there, but no multiyear periods. Note how insignificant the difference is between the peak in the 1940s and the peak attributable to the 1997/98 El Nino. There’s approximately a 0.04 deg C difference. Comment: The very helpful analysis should be extended to such questions as: (1) Whether a there was a prolonged El Nino event over three years in the early 1940s, as it would be the only case over the recorded period. 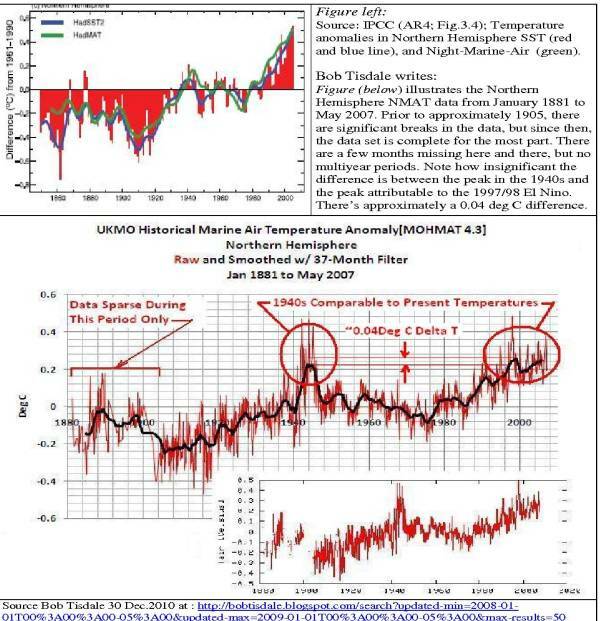 (2) The data do not reflect El Nino conditions observed in 1939.